Group Photo of Participants at the Medical Physics Meeting, which was brain storming on how to jumpstart a program for faculty and clinician development in the field, in line with sustainable support of the vision embodied in the BIG FOUR Agenda, on 12th December 2018. Prof. Michael Gatari, Director, Institute of Nuclear Science & Technology attending the First WHO Global Conference on Air Pollution and Health at WHO HQs in Geneva, Switzerland, 30th October to 1st November 2018. Prof Michael Gatari (University of Nairobi); Dr Mark Rubarenzya (Uganda National Roads Authority); Dr William Avis (University of Birmingham); Dr Lauren Andres (University of Birmingham) presented the activities of “A Systems Approach to Air Pollution (ASAP) – East Africa” at the African Studies Association Conference on 12th September 2018, University of Birmingham, UK. Mr John Birir, a staff at the INST, made an oral presentation on his paper "Interaction of ultrasonic waves with defects" during NDE2018 conference. Dr Andrea Mazzeo (PhD), Research Fellow at University of Birmingham, Department of Civil Engineering, gave a seminar on air Pollution Modelling on 7th December 2018 at the Institute of Nuclear Science & Technology. Prof. Peter J.T. Verheijen, from Department of Biotechnology, Delft University of Technology , Netherlands, delivered a 5 day Graduate course on Statistics and Introduction to modelling from 5th to 9th November 2018. Prof. Peter J.T. Verheijen, from Department of Biotechnology, Delft University of Technology , Netherlands, gave a seminar on 'Overview of mathematical modelling techniques' at the Institute of Nuclear Science & Technology on 9th November 2018. The inaugural University of Nairobi Research Week was held from October 22nd to 26th, 2018 the University hosted eleven International Conferences covering a broad range of disciplines. The first semester for the academic year 2018/2019 at the Institute of Nuclear Science and Technology commenced on 1st October 2018 with the reporting of the new students for the Master of Science in Nuclear Science Programme. The IAEA/OIOS evaluation exercise in the country kicked off yesterday, 1st October 2018 at the Institute of Nuclear Science and Technology. The Institute of Global Innovations from the University of Birmingham led by Professor Francis Pope held a joint symposia on "Urban Resilience" on 18 September 2018 at the Institute of Nuclear Science and Technology. Congratulations to the following students who graduated today 14th September at the 59th Congregation for the conferment of Degrees and award of Diplomas. IAEA Safeguards inspectors, Teshome Bayou Temesgen and Albert Bopape, together with Radiation Protection Officers from Radiation Protection Board, Arthur O. Koten and Isaaac Mundia visited the Institute of Nuclear Science and Technology on 11th September 2018 to carry out verification activities. 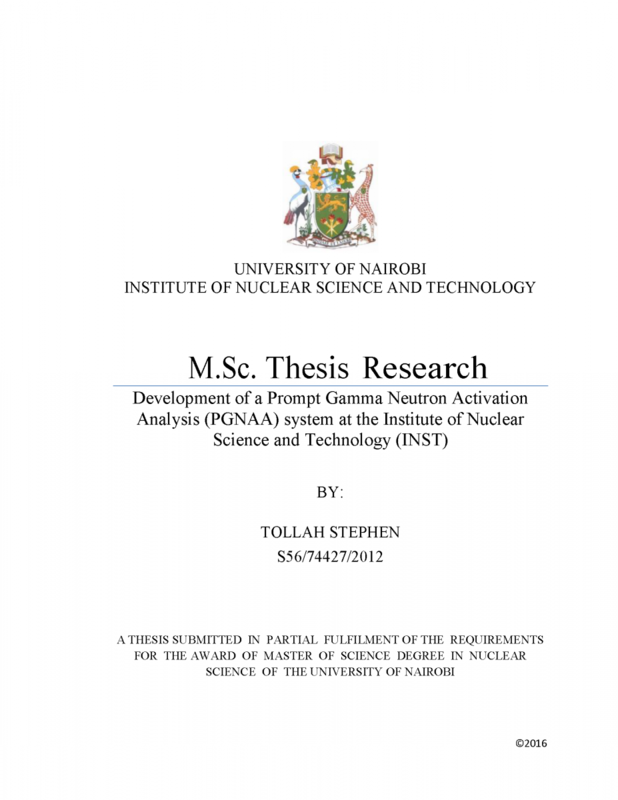 The Institute of Nuclear Science & Technology, University of Nairobi has planned a national two(2) weeks training and a certification workshop in radiotracers and gamma scanning for industrial applications , from 24 September to 5 October, 2018 to be held at the Institute of Nuclear Science & Technology , University of Nairobi and Kenya Bureau of Stanards (KEBS) Laboratories. Mr. S. Bartilol attended an Advanced Training Course on Source Search and Secure between 13th and 18th August 2018 at The Great Rift Valley Lodge in Naivasha. Mr. John Birir, a staff at the Institute of Nuclear Science & Technology, participated in an IAEA regional training course on 'Addressing Insider Threats for Radioactive Material and Associated Facilities' held between 30th July and 3 August 2018 in Nairobi. 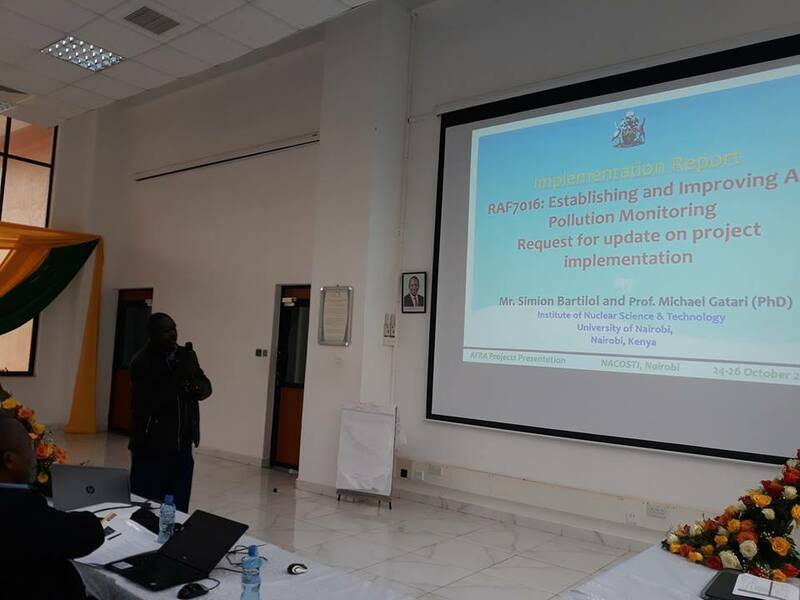 As a key stakeholder in the field of radiological and nuclear incidents, the Institute of Nuclear Science & Technology (INST) participated in the regional workshop on radiological incident response plans organized by ENCO under CBRN CoE Project 60: Support the Center of Excellence of Eastern and Central Africa in Nuclear Security. The Institute of Nuclear Science & Technology participated, through the provision of expertise, during the radiation protection and safety training held between 6 - 10 August 2018 organized by the Kenya Bureau of Standards. Kenya Accreditation Services (KENAS), Mr. Martin Chesire, presents the certificate to the Vice-Chancellor, UoN, Prof. Peter Mbithi. Located in the Institute of Nuclear Science and Technology in the College of Architecture and Engineering, the lab has met the ISO 17025:2015 specifications. in laboratory environment and work practices. energy and potential market in the sub-Saharan region. John Birir, a PhD. Student at the Institute of Nuclear Science & Technology presented his research progress to the INST academic staff. His work is based on Method development of super resolution imaging of ultrasonic guided waves. Wilson Kairu, a PhD. Student at the Institute of Nuclear Science & Technology presented his research progress to the INST academic staff. His work is based on Method development for health monitoring of concrete structure using embedded acoustic waveguided sensors. Susan Karuga, a PhD. Student at the Institute of Nuclear Science & Technology presented her research progress to the INST academic staff. Her work is based on Solid State Materials for Lithium ion Batteries. After the Second World War, Korea was facing a chronic power shortage and their first president, Dr Syngman Rhee, was looking for radical measures to address this problem. The Institute of Nuclear Science & Technology is hosting a guest lecturer Dr Chanoh Park from Korean Nuclear Agency from 3rd-11th July 2017. Dr Chanoh will offer lecturers in Rector Physics to our 2016/2017 MSc class. His visit is a result of a collaboration between Korea Nuclear Agency and the Kenya Nuclear Electricity Board. Omondi Cavin, an MSc. Student at the Institute of Nuclear Science & Technology, successfully defended his research thesis titled: “Distribution of Heavy Metals in Water and Sediments of Lower River Nzoia” on 22nd June 2017. Tollah Stephen, an MSc. Student at the Institute of Nuclear Science & Technology, successfully defended his research thesis titled: “Development of a Prompt Gamma Neutron Activation Analysis (PGNAA) system at the Institute of Nuclear Science and Technology (INST)” on 9th June 2017. Anselim Mwaura, an MSc. Student at the Institute of Nuclear Science & Technology successfully defended his thesis titled: “Design and Characterisation of an Electrohydrodynamic Multinozzle Atomizer for Thermal Desalination Processes” on 4th May 2017. Prof. Erik Kelder from Delft University of Technology Netherlands gives a seminar at the Insitute of Nuclear Science. Director welcoming the Students who were selected to join the Masters class on Nuclear Science 2017. Ms.Lindah Karea (2nd R) poses for a group photos with her innovation team members. The University of Nairobi (UoN), University of Copenhagen (UCPH), and the Danish Institute for International Studies (DIIS) invite interested and qualified Kenyan candidates holding a graduate degree in Development Studies, Human Geography, Environmental Studies, Political Science or any other relevant social science discipline to apply for one of the four PhD scholarships related to the research programme, “Rights and Resilience in Kenya” (RARE).